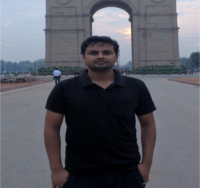 I completed my PhD in the Department of Computer Science and Engineering at IIT Delhi where I was working with Prof. Ragesh Jaiswal. Please find my new webpage here. Research Interests: My research interests are in theoretical aspects in computer science. Summary: We consider the random sampling problem in the streaming setting. The algorithm returns, at any time t, an item chosen uniformly at random from all items seen till time t. Our model allows storage for only one item at a time in the stream. We design an algorithm that takes O(log n) random bits and O(log n) space to maintain a random sample at all times. Our algorithm in the streaming setting matches the lower bound on the amount of required randomness for uniform sampling in the offline setting. We also extend the work on sampling in the query model by Bringmann and Larsen (STOC 2013) to the approximate setting and obtain almost matching upper and lower bounds for the problem.